Fly Fish the Deschutes River for Surface Striking Steelhead! Deschutes River steelhead usually start arriving in fishable numbers in mid-July and run until the end of the season in December. We feel the best 'prime' time to take Deschutes Steelhead on a floating line is from late August through October, with a tail out season through November. These unique steelhead are well known for their smashing surface strikes and long line ripping runs. To increase your chances of success, when fishing for steelhead on the Deschutes River you try to cover as much water as possible. For this reason our Single-Day Steelhead Trips are a full day of guiding and fishing, from sun up, 'til sun down. To take full advantage and maximize the short season and to increase your chances of landing a Deschutes Steelhead, we recommend our camping trips. With Multi-Day Trips, we live, eat and breathe steelhead fishing. During our Multi-Day Camp Trips, we cover up to 35 miles of river, fishing every inch of steelhead water from Macks Canyon to the mouth - This alone will increase your chances of catching a Deschutes Steelhead. There are also steelhead entering the river which are not considered native Deschutes River Steelhead. 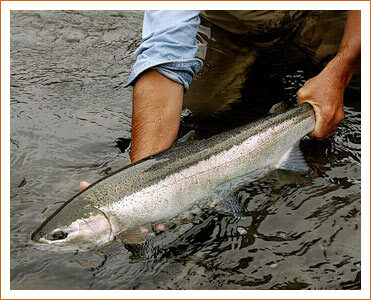 These non-native steelhead are referred to as strays, with the majority of these fish originating from Idaho. Strays enter the lower Deschutes River for a short lay-over, until river conditions become conducive for them to continue their journey home to Idaho. Strays can average in size up to 20 lbs. The Deschutes River truly offers some of the best surface steelhead fishing opportunities in the U.S. Call us toll free at 1-800-510-1702 today. Your Oregon Fly Fishing Guide for the Deschutes and Sandy Rivers. Call us today at 1-800-510-1702! ©2014 Silvey's Fly Fishing Guide Service. All Rights Reserved. Legal Information.